The Baker “D” model resaw is designed to give you the benefit of kerf savings, and allow you to resaw material up to 16” × 16”. This is the Baker Band Resaw taken to the next level, allowing for larger capacity, but using similar 11/4” or 1½” blades that are used in other Baker Band Resaws. There are many “D” model configurations available. Single and multihead machines are available. The Comer & Goer is especially popular with grade lumber producers. 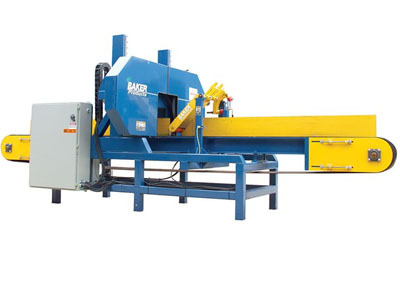 This resaw uses a unique configuration that has heads on both of the conveyors on the machine. With this resawing method, boards are cut on each pass, minimizing down time and the time needed to return uncut material. Adding Baker turnarounds to any model increases production. Options to let the sawyer turn the cant to choose the best face are available.